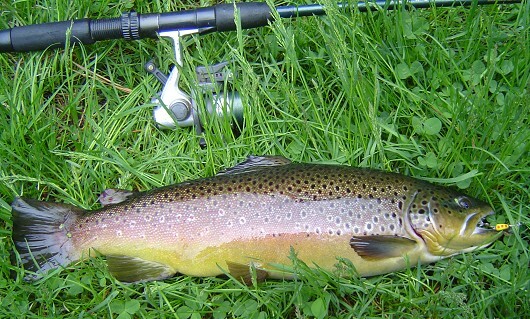 Brown trout, approximately 20 cm (8”) long. Location: Deer Creek, California Date: 6/21/2007. Brown trout. Photo by Dan Worth, California Department of Fish and Game. Brown Trout can be found in a large variety of waters, from spring fed trickles to large lakes and reservoirs, but find their optimal habitat in medium to large, slightly alkaline, clear streams, with swift ripples and deep pools. 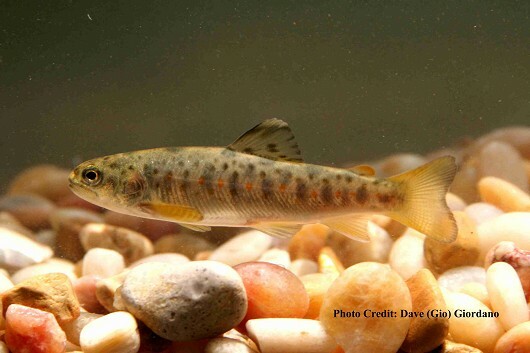 In general, as the trout get older they move towards deeper waters with fry staying in low velocity edge waters less than 30 cm deep, juveniles found in higher velocity water 50-75 cm deep with large rocks, logs, and overhead cover, and adults keeping to pools 0.7-3.5 m deep. There are also differences in habitat based upon the trout’s maturity level. Non-reproducing fish are usually sedentary, staying near or under the same piece of dense cover constantly, but reproducing fish will establish a feeding territory and actively protect it. As the fish get larger their territory will expand until they reach approximately 25 cm in length. At this point they become more mobile, staying under cover during the day, but patrolling a larger area at night for active feeding. Although temperatures of 28-29°C can be survived for a short period of time, Brown Trout are generally cold water fish, preferring temperatures between 12°C and 20°C. Brown Trout may also be sea run, particularly in their native Europe, North Africa, and western Asia, but this is rare in California. The diet of a Brown Trout can change dramatically over the course of its lifetime. Smaller individuals focus on drift organisms, in particular terrestrial insects, before shifting to more bottom dwelling invertebrates as they get larger. By the time they are 25 cm in length and have moved away from a feeding territory they will actively pursue other fish, crayfish, and dragonfly larvae; Brown Trout over 40 cm feed almost exclusively on other fish. All sizes will eat terrestrial insects in late summer when there are massive hatching events creating a large enough supply of food to support even the largest individuals. They will feed at any time of the day but most intensely at dusk and dawn. Individuals may become specialized at hunting one certain type of prey while others are generalists in their prey choices. This results in a wide diversity of diets within a population. Maturity is usually reached in the 2nd or 3rd year and breeding occurs in November and December. A rise in water level signals the trout to head to spawning territory but the final redd site is not selected until temperatures drop below 6-10°C. Streams with riffles that have pea- to walnut-sized gravel are usually required for spawning, with the best locations at the tails of pools with deeper, less turbulent water, and more complete cover. A female constructs the redd in the gravel bottom while the male protects and courts her. Once the redd is complete the pair will hold position next to each other and release their eggs and sperm simultaneously. After fertilization the female will, in a single shift of gravel, bury the eggs she has just laid and construct a new redd for the next batch. Each redd will hold 100 to 250 eggs and a female can lay between 200-21,000 over the course of a breeding season. This difference in fecundity can sometimes be based on the trout’s surroundings. In heavy cover it is more common to find large eggs in smaller numbers while females in areas of lighter cover tend to produce a greater number of smaller eggs. It can take anywhere between 4 and 21 weeks for the embryos to hatch, but 7-8 weeks is the norm. Alevins will emerge 3-6 weeks later and move towards calm, nearshore waters where they find cover among large rocks and under overhanging plants. 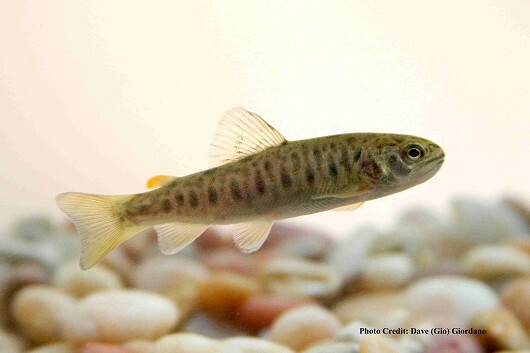 These young trout will grow to 3-8 cm in length their first year and 7-22 cm in their second. This diversity can be caused by differences in temperature, alkalinity, dissolved solids, turbidity, population density, or food availability. The largest individual ever recorded was a 103 cm long fish from Scotland and the largest California fish was measured at 12 kg. Norwegian Brown Trout have been known to live as long as 35 years but in California 9 years old seems to be the limit.